Often, people tend to ask what got me into Transformers. My answer tends to confuse them, as it's always pretty simple. It's pretty simple, really, but I guess it does need further explanation. You see, when I was a kid, Star Wars was everywhere. Literally everywhere. It was on our lunch boxes, school supplies, clothing, cereal, our everything. As one could expect, it flavored everything. The package art for video games sure did seem similar. Fantasy and sci fi entertainment was everywhere. Robot toys were already on shelves, Shogun Warrior leftovers and random Japanese toys that found their way to store shelves. As Star Wars was winding down, these robot toys started appearing more heavily as well as robot cartoons started filling the airwaves. One of my favorites, was a Saturday morning cartoon called "Mighty Orbots" that had the best music, the coolest robots, and just the funnest show. Voltron and Gobots were beginning to be a thing, and then it happened. As more kids did back then, after school I had came in from playing and was watching my cartoons before dinner when this new robot toy commercial came on. I was mesmerized. I was transfixed. I was glued to the screen. Who are these guys? Can I have them? The next day at school, I was in kindergarten and we had some sort of standardized testing going on. The teacher made us put up these paper barriers so nobody could see your work. When you were done with whatever section you were working on, you had to sit in silence until the teacher called for time to stop. I have always been a daydreamer, so it was no problem keeping myself occupied during that silent time. I found myself fantasizing over those cool Transformers things I just saw on tv. I had imagined I found a box of them on the side of the road and had them all. For some reason, I remember thinking Thundercracker was the main character. Time went on, and as children do, I would get toys of all these new robots. There were plenty of cheap copycats, and bootlegs. Gobots and Convertors were much cheaper, so I ended up with a lot of those in particular. Being from a middle class blue collar family, Transformers were a little too expensive for a weekend allowance toy. But I still managed to get a real Transformer on occasion. One week, my brother and I had to stay the week at our Grandmothers house. My brother being 6 years older than me would often roam the neighborhood while I was pretty much at Grandmas playing with my Jeeper Creeper Gobot and reading issues of the all new Transformers comic that was starting to pop up while Gilligan's Island reruns were playing in the background. One day, shortly before we had to go back home, my brother got me and made me go with him down the street. A kid who had gotten Optimus Prime had set him up in his garage and was basically showing him off to all the kids. I was already hooked, now I really needed more. Before I knew it, the Transformers had a cartoon show that came on in my area in an afternoon block with GI JOE. Not to mention, another channel would show it on Sunday. Topping of off, Bozo the clown began showing episodes. I didn't have a chance, Transformers fast became my favorite cartoon. It was a good time for kids entertainment and I was fortunate to have such cartoons as Transformers, GI JOE, He-Man, Voltron, Robotech, M.A.S.K, Robotix, and so many more on tv regularly. While not from the most wealthy family, was fortunate enough to really delve into all my interests. I had a subscription to He-Man and GI-JOE magazine, an Atari (later NES). Tons of cool toys, and always had my nose in some monster book. As I got older, Transformers went away (we had no clue it was just in America) for a few years. I still read my old comics over and over regularly. As middle school marched on, despite my best attempts to be cool and play sports, I slowly accepted that they just were not for me (though I did buy baseball cards for a while, turns out I liked collecting things). I was a regular reader of Fangoria, video game magazines, and other similar publications. In those days, they'd have several pages of random classifieds and ads for mail away stores. I often would send in a dollar to some of these ads to get on mailing lists. Oh man, the random catalogs, newsletters, and homemade magazines (it took a few years to learn they were called fanzines) I would receive. Often I'd get great little books made from Xerox copies full of stories based on all sorts of cartoons and games (I also didn't know yet what fanfic was), including Transformers! This went on for a few years and before I knew it, Transformers G2 had started. Reruns of my precious cartoon came on in the morning before school and it was great. I'd occasionally get a G2 toy, usually from the local Goodwill that managed to get recent toys really often. New comics started back up and oh man, that was awesome. Of course now I was in high school and at my school peer pressure pretty much meant to keeping such interests secret. Time went on, and I was a community college student, Beast Wars was going on, and I started using the Internet. First in my high school library, then my college library, but the minute I was able to use it at home, I was in heaven. For someone with my interests, I had a hard time meeting others who had similar interests. Now, I was in touch with people who liked Super Mario, liked watching old horror movies, liked cartoons, and hey... look at all these people who also like Transformers. Neat. I had a part time job at Office Max and before I knew it, the occasional toy purchase became regular purchases as now I had this thing called 'disposable income'. 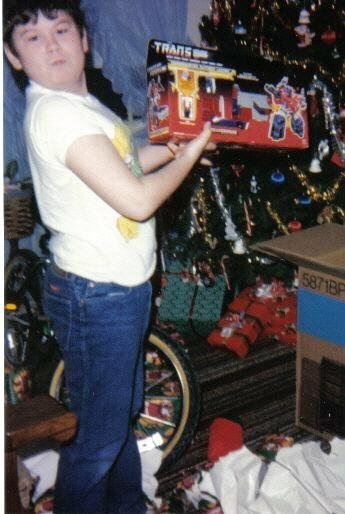 Turns out, I was a 'fan' and 'collected Transformers'. I thought I just really liked them and bought toys.